For Venezuelans based in Houston, the popular referendum today rejected by the National Constituent Assembly promoted by the government of President Nicolas Maduro is a symbol of civic maturity and hope. Fabiola Colmenares, an actress known for participating in countless telenovelas and now an activist based in Houston for a year, told Efe that the massive participation of her compatriots will become a challenge for Venezuelan leaders. The theater actress also emphasized the difference of other elections and plebiscites in Venezuela where there were greater obstacles for citizens in exile. “Moreover, it is a policy of the government not to want to know how many we are and to prevent to manifest our will through a systematic violation of our basic constitutional right that is to vote,” he added. 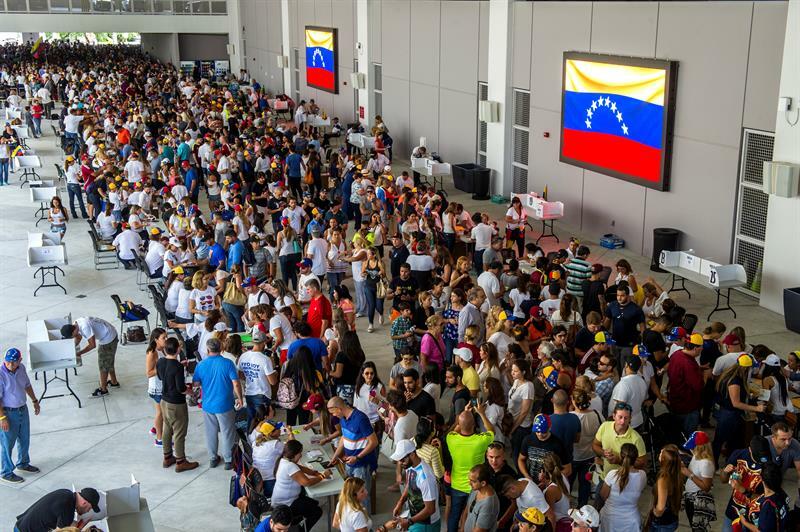 Colmenares estimates that at the polling station located in the city of Katy, a suburb east of Houston and where the largest number of Venezuelans are concentrated, more than 6,000 are participating in the consultation. For Haydee Carvallo, Coordinator of the Bureau of Democratic Unity (MUD) Houston, this process will also reveal a figure that will expose the approximate number of Venezuelan citizens who live in this area and in every corner of the world. “And we will let the regime know that we do not agree with the political maneuvers they are pursuing that only seek perpetuity and that Venezuela becomes a Cuba,” Carvallo said. Liliani Avila, who used her Identity Card to participate in this consultation covered by the Venezuelan Constitution, said that the unsustainable economic crisis and citizen insecurity in her country forced her to leave a year ago. “This is our opportunity to tell the government of Nicolás Maduro that we do want a change and that we do need him to leave the country,” remarked Ávila, who works in the accounting area of ​​a Houston company. The plebiscite, which has been described as “internal consultation” of opposition parties by Chavismo, asks Venezuelans if they reject the National Constituent Assembly to be elected next July 30, set in motion by the ruling party to elaborate a new Magna Carta.